Getting tired of the party life in Pattaya, wanna enjoy a beautifu day on a island, lets go and visit koh larn. To arrive koh larn u need to get a 40 min. boat drive done, so its pretty near to pattaya and perfect for a day trip. The price for the boat is only 30 bht, thats less then 1$ for the ride. Be careful how much u pay them, becaus they allways try to not give you your change money back, and act like they even not know the price, cunts. If u arrive Koh Larn u properbly should rent a chair and relax at the beach, the prices are around 200bht for the hole day, but it also depends on your quilty of negotiation about the price.U got there plenty of restaurant so dont worry about your stomach 😉 I only will recommend to take your towl with some suncream, a bottle of water for the drive and a sunny early day. When u already visit koh larn once or twice then u should try to rent a scooter and explore the island by yourself, u will definatly find some cool unseen places u never see before, 300 bht is the maximum for the rent of a scooter per day. Dont forgett to watch on the time, when u dont get the last boat of the day at 06:30 p.m. then u have to sleep at one of the hotels there, eventually u will find one of the overprices Speedboat drivers.Most of the people on Koh Larn are Asians like Chinas and Japanes.Anyway, when u want a relaxed day on a beautiful beach which is not compareable with the pattaya beach, then give koh larn a visit. U really can come down here and relax a bit from the struggle. Check the location of the Island out, to see how close it is. Getting tired of the Party Nghtlife in Pattaya. 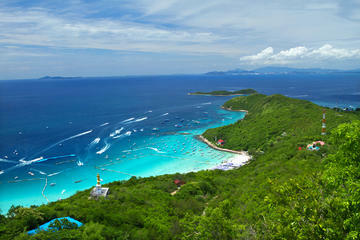 Why not take a day off and visit a beautiful Island called Koh Larn.